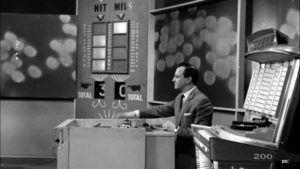 Juke Box Jury was one of the BBC’s flagship programmes, which introduced viewers to Saturday evening viewing during the sixties. The hope was that having started watching JBJ, viewers would enjoy it and continue to watch the BBC programmes that followed, such as Dixon of Dock Green, The Billy Cotton Band Show, Perry Mason, etc., for the rest of the evening. Since the BBC carelessly wiped all but two episodes, our long-term aim is for this developing website to be able to include the relevant details of all 400-plus programmes. This will feature not only the panellists and the records on which they voted, but also the identity of every mystery guest. A slightly less easy goal is to indicate a hit or a miss decision for each record played and discussed. Clearly, especially to begin with, certain detail will be missing so we welcome contributions from everybody who might be able to help, from those who took part in the shows, or were in the audience, but also from those who watched, avidly. Since the BBC carelessly wiped all but two episodes, our long-term aim is for this developing website to be able to include the relevant details of all 400-plus programmes. This will feature not only the panellists and the records on which they voted, but also the identity of every mystery guest. A slightly less easy goal is to indicate a hit or a miss decision for each record played and discussed. © 2019 Geoff Leonard, Bristol, UK.